← The New Northwest added to Historic Oregon Newspapers! These days, posting a personal ad or joining an online dating site is common and (generally speaking), a culturally accepted way to find a potential relationship. Online dating sites like Match.com like to boast that one-in-five new relationships begins from an online encounter (Match.com’s blog entry on their survey). Whether you believe the accuracy of this statistic or not, online dating, personal ads and the resulting relationships are normal enough that chances are you know or have encountered someone who has tried one of these non-traditional versions of matchmaking. Finding alternate ways to meet mates certainly isn’t a new idea. Personal ads have been around for over 300 years in different forms and variations. In the 18th and 19th centuries, “matrimonial agencies” were often called upon to deftly and confidentially assist bachelors and old maids over the age of 21 to help with the shameful problem of singledom. These agencies collected correspondence from hopeful ladies and gents and relayed them to prospective matches, preferably resulting in a marriage. By the late 1800s, even the Salvation Army was getting into the matchmaking business, with hopes to “materially lessen the number of unsuitable unions.” The Evening Capital Journal from Salem describes this business venture as it unfolded in London: “A Matrimonial Agency” from April 11, 1892. Matrimonial agencies often had their own circulating publications, but they also frequently created newspaper ads in local newspapers on behalf of their clients, taking advantage of the near-ubiquitous newspaper readership of that time. Although it was certainly useful to ask a matrimonial agency for help, it was also quite embarrassing and not something a respectable couple would outline in their marriage announcement. 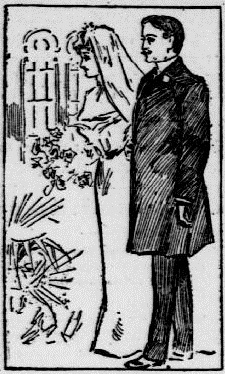 It was quite surprising then, for people to publicly mention their involvement with a matrimonial agency, like this couple in the April 26, 1903 edition of The Sunday Oregonian. Her hopes of snagging a wealthy husband (or at least one who can pay the bills) seem to have backfired after the nuptials were read. Much like today, there were no guarantees that an advertisement would lead to a successful union or, if one of the correspondents was particularly cunning, even lead to a successful meeting. The Morning Oregonian from November 24, 1903 tells the sad story of a tailor, waiting fruitlessly for his paramour to appear. Of course there have always been those particular youth who are bolder and more independent than their peers. These brave souls took it upon themselves to post their own personal ads without the help of matrimonial agencies. These advertisements were often mailed to the postmaster general and forwarded to local newspapers. This meant that postings could originate from across the country with the hopes of snagging more exotic partners. Creating your own personal ad also meant the ability to skew the facts and/or perhaps be a bit more demanding in your requirements for a mate. For example, this California woman in 1909 cares naught for appearance, but requires any interested suitor to be worth at least a quarter of a million dollars (the modern equivalent of about $6 million). One particular phenomena that benefited from the advent of newspaper advertisements was the tradition of Leap Year Proposals. Historically, February 29th, the extra day in the Gregorian calendar every four years, has informally given special privileges to marriage-minded women. According to English Law, the day was “leaped over” and carried no legal status with it.¹ It was generally assumed that traditions also held no merit on the day. This was exciting news for daring women who had the opportunity to reverse the tables and propose marriage on that leap year day. (See Snope.com’s description of the tradition). You can see here in this April 06, 1908 issue of The Coos Bay Times that some newspapers published lists of all the eligible bachelors in the surrounding towns in order to give the all single ladies a chance to hunt them down and offer up a proposal of marriage. Some men didn’t necessarily appreciate being exposed as single men, however: “Times Recieves Protests From Bachelor Brigade”. Needless to say, any advertisements at all with the subject of marriage often scandalized the older members of the community of newspaper readers. You can read an editorial denouncing the whole practice of personal advertisements here: “Advertising for Husbands”. Personal ads have been bringing couples together for over 300 years and been taboo for nearly the same length of time. Luckily for today’s singles, online formats have made dating advertisements and profiles a more accepted way to meet people. If you’re looking to post a personal ad and in need of some inspiration, I’ve listed a few of my favorite advertisements here for your viewing pleasure. You can find your own favorites, be they sweet or scandalous, at http://libweb.uoregon.edu/diglib/odnp/. Thank you! You should be able to click on any of the clippings and be taken to the historic newspaper page where it originated where you can then browse the paper if you so wish. Please let me know if that isn’t the case!